Build Threads Create a build thread to compile pictures and descriptions of your LR build. Thought l'd start a new build/swap thread about the 03. Granted, most of the build will be swapping parts...but several changes are planned along the way. And who knows...maybe l'll finally finish my front bumper while it's off. I've never added the fender ends, which would be nice for jacking proposes. Anyhow, this rover will replace my 01. 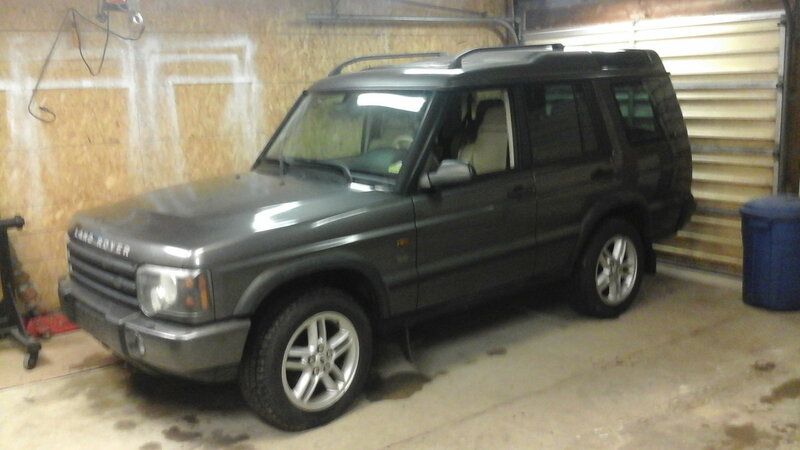 Not going to lie....part of me will be sad to see the old girl get disassembled...being my first true land rover love. But, she is not worth selling and actually worth more in parts (since we have the others). I'll keep entire drive train and other little do-dads. The 03 came to me as a non-runner. After changing crank sensor without any success, found the ignition relay loose and pushed it in...and she runs great now. First plans are to do all fluid changes and swap out non-CDL transfer case. Have an 04, with factory shifter, under the work bench. I'll probably drive it for a few weeks, before any of the swapping of parts happen. Plus, hit a deer with the Silverado...so that's going in for repairs...this makes the 03 a daily driver until l can take her off the road long enough for transfer case swap. 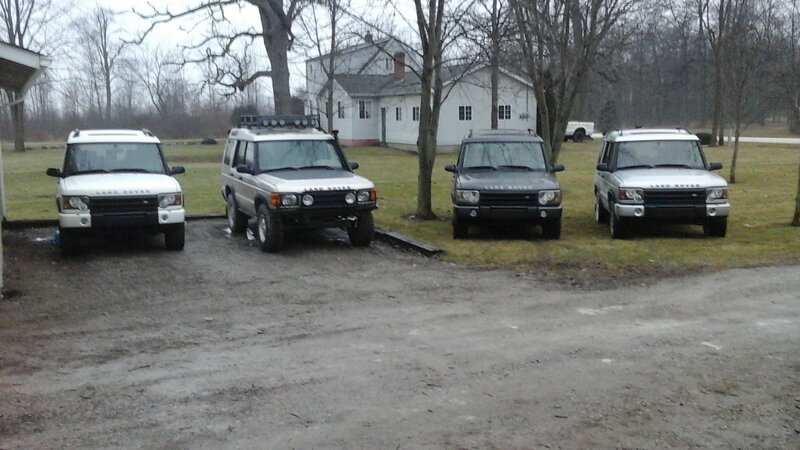 Anyhow...here is my new trail rig...and her new family. Again, l'm going to hate seeing the old 01 go...her and l shared some fine times together...plus, drove her for 38K over the last two years...not bad for a five hundred dollar initial investment and another $700 for trans, drive shaft and y-pipe...but it was time for a bit nicer rig. An ignition relay, I hope you got one heckuva good deal cuz they don't get any easier to fix! 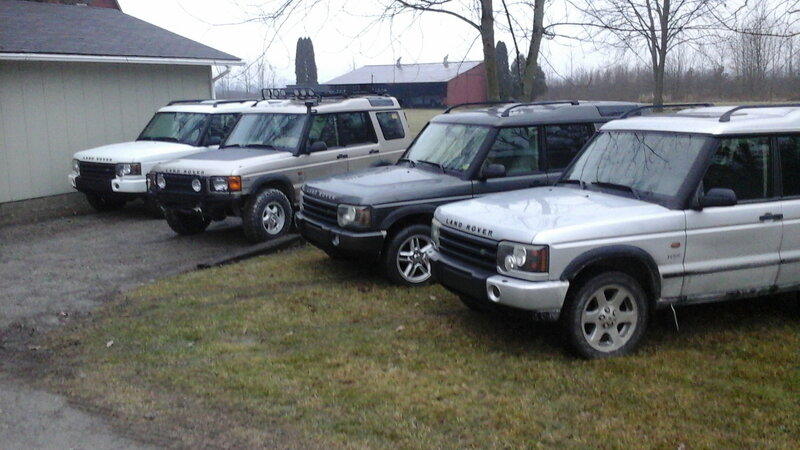 When are ya gonna get an LR3? That’s a nice colour Brian I’m excited for you, what changes are you planning? The new truck needs a name. After looking at this list...yes, l pretty much offend everyone with my not PC names...lol. Truth be told...l'm not much into naming vehicles. After owning about 40 over the past 42 years...no need getting to personal. They'd just put a new set of bridgestone blizzards on it, that alone is double what l paid for it. Bottom feeder here, so l'm always circling the near-death/dead opportunities. It's funny, that you should mention an LR3. That was the vehicle that originally started this rover never-ending journey. We'd been driving by it for months, stopped to look at it twice, then drove it and upon our return...parked it out front of the used car dealer. They say you should "sleep on things"...so we did. Next day went back and it was gone. Salesman said someone drove by and saw it out front (instead of buried between other vehicles)...and bought it after we left. Sometimes, l wonder how that little change in fate...changed our lives forever...four Dll's later...lol. Driven about fifty miles so far. Changed thermostat and anti-freeze (red to green), finished installing fuel pump cover and carpet (previous owner gave up there), added four quarts of trans fluid, added one quart of transfer case fluid, repaired loose spare tire (when Discount Tires installed new tires...they used the regular tire lugnuts, instead of the three specific spare tire lugnuts - ones with small bulge on outer end of chrome cap), lubed drive shafts and hi-low shifter cable. Putting plates on her Thursday. The swapping of parts and accessories will probably start over the new year holidays. Last edited by The Deputy; 12-25-2018 at 03:51 AM. Called and put insurance on the 03 Wednesday, drove it to work...with plans of stopping at the DMV and getting plates after work. Everything goes well, that is, until l write the check for $204.00 for title transfer and plates. The rover marched right along, going to work and to the DMV. But, moments after leaving the DMV, like a hunderd feet...she starts missing and dies. We coast to a safe spot and I grab my code reader...several misfire codes. I'm like??? Then my brain kicks into gear...and l glance at the gas gauge...which is on 1/8 tank. I'm like...no way...can't be...oh yes it can be...lol. Out comes the cell phone and l call my wife and she brings me ten gallons of gas. I'd wanted to burn all of the old stinky gas out of it...so l guess l accomplished that. Anyhow. Rover starts right up, hurray! She says, "l'll follow you." I'm like..."l'll be fine"...but she does anyway. We're going right along, but my wife catches a light. Luckily there was some dude in between my wife and l when we first left and he was riding my ***. Luckily l say, because when l looked back and saw that he had backed off suddenly...it caught my attention enough to make me wonder why and glance at both rear view mirrors. When l looked out the passengers side mirror...l saw a huge cloud of steam billowing out from the rear. Glance at temp gauge, still normal...but l know that won't last long...so l whip into a parking lot. Crack the hood to see the top radiator hose blowing anti-freeze everywhere. So, out comes the cell phone again, praying that my wife has brought hers, since the last time l saw hers...it was sitting on the console of her rover (and she was in the truck now). She answers, picks me up and we head for home to retrieve the trailer. Put a new hose on, which l had from the white 04 that is disassembled, refilled, road tested and l'm heading for work in a few minutes...so wish me luck. Last edited by The Deputy; 12-28-2018 at 03:00 AM. Wishing you luck cuz anything that doesn’t happen in a Rover is luck. I kinda chuckled at your adventure, been there a time or ten. Your wife deserves the world, she is very rare and obviously knows your penchant for strays.